RHS SGC members enjoy a day of leadership, team building, and school spirit. On Tuesday, November 4 members of the Rockland High School Student Government Council attended the Fall Southeastern Massachusetts Association of Student Councils (SEMASC) Conference at Middleboro High School. 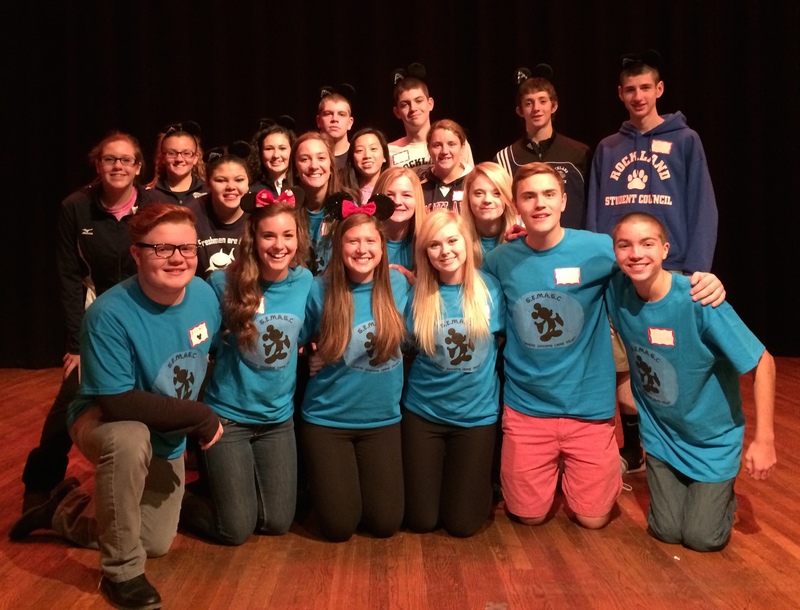 This year the conference theme was Premiering in Theaters: SEMASC Leaders. RHS was represented by 20 students. The SGC members who attended the conference were chosen by their advisers and the Council’s President Katie DeLorey, Secretary Haley Macray, Treasurer Ryan Sugrue, and Publicity Coordinator Ashley Pezzella for outstanding work and dedication to SGC within the past few months. Pezzella ran for SEMASC President, giving a speech in which she intertwined the magic of Disney with the appeal of SEMASC and student government. Following voting, it was announced that Pezzella was chosen to be President-Elect; she will take on the position of SEMASC President in the spring. SGC members spent the day in workshops that focused on key aspects of student council such as spirit, teamwork, and planning. For SGC’s freshmen, Fall SEMASC was their first taste of what student council has to offer outside of the school level. A big hit amongst SGC members was the guest speaker, Grant Baldwin. Sugrue also enjoyed Baldwin’s message. Overall, the Fall SEMASC conference was a chance for both new and veteran SGC members to explore their leadership qualities and gain ideas and inspiration to bring back to RHS and the rest of the council.